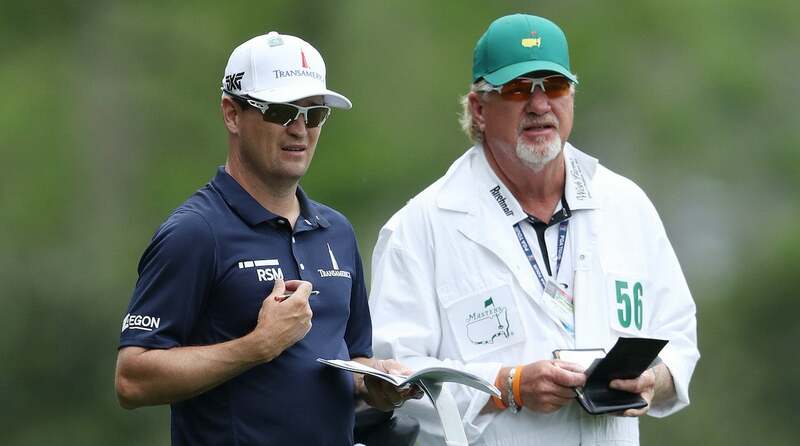 Zach Johnson has split with longtime caddie Damon Green, according to a report from The Caddie Network. Green had been with Johnson since 2003; together the partnership won two majors, nine other PGA Tour events and banked tens of millions in prize money. The move came as a surprise to Green. "Zach said, 'I think we need to take a break. It’s not a ‘firing.’ We’re too good friends for that.'" Green told The Caddie Network. "I just think he didn’t want to say the word ‘fire.’ I was shocked." Green, 58, is a golf lifer, and more than just a looper. As a player, he won dozens of mini-tour events and came one two-footer away from earning his Tour card in 1994. In recent years, he has competed sporadically in golf's senior circuits, even contending at the 2011 U.S. Senior Open. But he has gained an identity as the man on Johnson's bag; the two have made 387 starts together. Green and Johnson at the 2018 Masters. "He’s probably had a Hall of Fame career and I had a front-row seat to it,” Green said. “It was great to watch." Green spoke of his love for caddying and said he expects to be back on a bag sooner or later. "I’d say it’s probably 80 percent I’ll caddie again. But it has to be the right situation." Green also became known for his celebratory "chicken dance" after particularly good shots. "Well, golf is so boring,” he told GOLF.com several years ago. "You’ve got to do something to spice it up a little bit." The Caddie Network added that Johnson is expected to replace Green with former mini-tour companion Brett Waldman, who has been Charley Hoffman's caddie. After six wins in a stretch from 2012-2015, Johnson's play has fallen off slightly in recent years. While he has remained impressively consistent — he made 20 of 23 cuts this season — he notched just two top 10s and rarely found himself in contention. He fell short of making the U.S. Ryder Cup squad and has slipped to No. 66 in the world. Johnson's caddie situation drew headlines at last month's Mayakoba Golf Classic. Green, suffering from the heat, stepped out after the front nine. As a replacement, Johnson turned to the crowd and found Matt Kuchar's wife, Sybi, who stepped in. Johnson rallied with an eagle and multiple birdies on the back nine. "He hadn’t been feeling well the last few days,” Johnson said of Green at the time. “I’m assuming he was dehydrated, but I don’t know. Matt saw Damon struggling, and I did, too. He didn’t look right. PGA Tour staff brought him in. I’d like to say it was the first time, but it’s happened like four times at Maui, Northern Trust at Bethpage, and a couple other places."